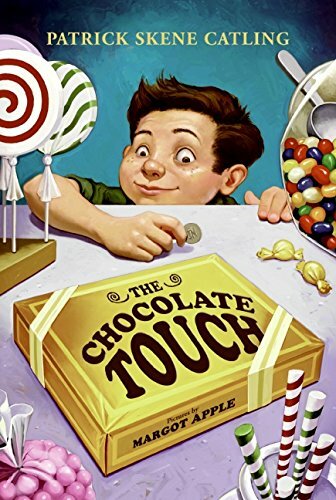 There’s something a little ridiculous about this tale, in which the Midas myth gets a chocolatey spin, but that’s part of what makes it such a great conversation starter. John Midas (yeah, no subtlety there) loves chocolate more than anything in the world — so when he discovers the best chocolate he’s ever tasted in a mysterious candy store, he’s thrilled that everything he eats turns into that marvelous chocolate. Chocolate apples, chocolate milk, even chocolate water — whatever John eats turns into chocolate. Of course, sometimes you just want a glass of cold water, and John is already feeling that his gift might be a curse when it starts intensifying: His trombone turns to chocolate in band, his pencil turns to chocolate in the middle of a math test, and finally, his own mother turns to chocolate when he gives her a kiss. Greed is bad is definitely the superficial message of this elementary morality story, but there’s much more than that to play with here. If you don’t already know the story of King Midas, read it together (the original is in Ovid) so you can appreciate some of the differences. One you’ll probably notice immediately is that Midas gets his famous golden touch as a reward — he helps out the god Dionysus, who rewards the king with one wish. Midas is the one who chooses to have everything he touches turn to gold, and when he asks Dionysus to take away the gift that has become a curse, Dionysus is happy to oblige. (Well, at least, he’s happy to tell Midas what he needs to do to get rid of it.) The morality angle is much subtler here — Midas’s problem isn’t necessarily that he’s greedy (though he does eschew money after this) but that he hasn’t really taken the time to think through the consequences of his wish. John, on the other hand, kind of stumbles into his gift-slash-curse because of his greed — it’s definitely something that happens to him and not something that he specifically asks for. It’s also interesting to look at this book’s take on healthy eating. The story was first published in 1952, a time when eating habits were radically different from what they are now. (You may be surprised that the average kid’s diet was better in the 1950s than in the 1990s, at least partly because of fewer soft drinks, more milk, and more healthy fats.) Nutrition was definitely a big deal at the time as the world recovered from the rationing and food shortages of World War II, and it’s clear from this book that there was a lot of conversation going on about how to promote healthy eating in the wake of wartime austerity. With plenty of food choices, would kids make the healthy choices? How do you make a child understand the importance of a healthy diet in a world of on-demand chocolate? John’s parents ask these questions throughout the book, and while John’s particular case resolves itself — it’s hard to imagine John ever eating chocolate again after what he’s been through — the bigger answers are missing. We talk A LOT about our diets and healthy food today, so it’s interesting to consider how John’s experiences might be different if they were happening in 2018. I have fond memories of this book from elementary school, when it was part of our classroom library, and we enjoyed it as a readaloud in our homeschool, too. Its 1950s provenance is definitely reflected in its white middle class narrative with clearly defined gender roles — I always think these things make for great conversation about privilege in narrative, but I know not everyone feels that way. All in all, I think it’s a fun read that has the potential to be much more than a morality story — though, honestly, it might be fun to read it alongside something like Everyman, too.